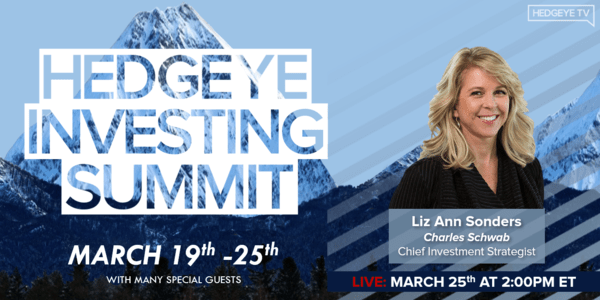 Liz Ann Sonders, Charles Schwab Chief Investment Strategist joined Hedgeye CEO Keith McCullough to dig deep into what investors should expect over the coming year during our recent Hedgeye Investing Summit. The duo covers a lot of ground including why investors should be concerned about an “earnings recession” and possibly even economic recession over the coming quarters. CLICK HERE to watch their entire 57-minute discussion. Keith McCullough: I'm Keith McCullough and we’re welcoming the anchor of our entire Hedgeye Investing Summit, Liz Ann Sonders. Liz Ann, I’m looking at the questions our viewers are asking, and it looks like everyone's asking you about the inversion of the yield curve. I definitely want your perspective on that because you study the history of markets. McCullough: Let’s talk about the Fed and their decisive decision this week and how that fits into inversion. Sonders: The decision was not only around going into pause mode, which they did from December to January—but the announcement they made about the balance sheet not just the runoff broadly but taking the runoff of mortgage backed securities and moving them into Treasuries which is almost a kind of a de facto pseudo-QE thing. Sonders: You already were in negative yielding territory across parts of the rest of the world. That boosts demand for Treasuries which, surprise, surprise, when you boost demand for something it brings the yield down. Sonders: Well yeah the market is telling you that there's a 60% likelihood of a cut this year. Sonders: I can think of a scenario under which the Fed probably has to hike here and that would not be a great scenario for risk assets. The scenario is they have to raise rates in a stagflation-type of environment. If you see tightness in the labor market move into more traditional measures of inflation and you get that in conjunction with a still slowing economy, it's kind of again worst case scenario to the extent it forces the Fed to move. If I went through every single data point in our predictive tracking algorithm which includes everything in GDP, you’d see the rate of change started slowing in October. We continue to slow, so growth slowing has indeed been the causal factor all along. And I still see a lot of people say, ‘Well that was a one off it's all priced in including the earnings slowdown,’ which also peaked in the third quarter. Sonders: You saw the peak in the leading indicators in September. Within a month or two in either direction almost all the subcomponents of the leading index rolled over. You saw the significant tightening in financial conditions which was one of the contributors to the rolling over and earnings expectations for 2019. That was another factor that I think made this environment somewhat unique as the last earnings recession we had was the last two quarters of 2015 first and two quarters of 2016. It was almost solely driven by the collapse the prior collapse in oil prices. There's so many hits to earnings looking ahead in 2019, that’s the simple math of the way year-over-year comps work. You have a tax cut passed into 2018. You don't have it again in 2019. You saw the strength in the dollar and the impact on exports. You saw weak global growth, especially in Europe which is a bigger driver of S&P sales than in China. You obviously had the trade war with China and you had the collapse in oil prices. McCullough: We’ll show on slide 70 exactly what Liz Ann just pointed out. I mean it's great to be able to talk to somebody who knows every numbers inside out. Wall Street is now expecting a positive Q1 but it's magically going to re accelerate by Q4. I mean I have earnings down like 7 to 9 percent throughout the second and third quarter year over year. So that's how I think you can get a more expensive market on the way down. Right. And I can't for the life of me understand why someone would like Financials here. I don't like them because financials went from 31% growth to 3% in the last two quarters. They haven't even comp’d the tough comps yet. Like what does Jamie Diamond have to do in the third quarter of 2019? If earnings are down 5 to 10% year-over-year the precedent for that is buy stocks? Sonders: I think if there were an instance where we could get an earnings recession absent an economic recession at some point the market becomes buyable. I just don't think we're likely to see those two divorced this time really. Sonders: Yeah, well first of all to say ‘We’re getting a recession’ to me that's dumb. I don't know why that is seen as such a bombastic view. That's what happens at the end of a cycle. CLICK HERE to watch the entire 57-minute discussion.